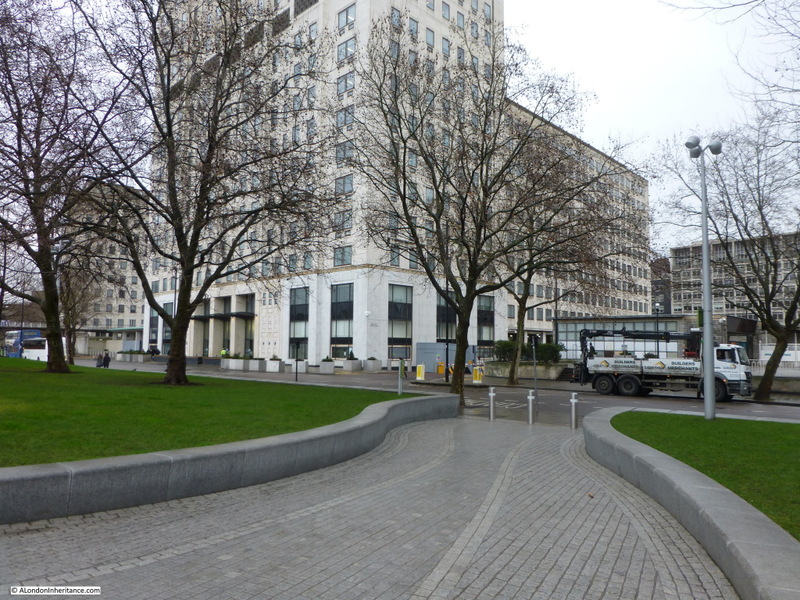 Following the closure of the Festival of Britain, the Southbank site was swiftly cleared apart from the Royal Festival Hall which was always planned as a permanent facility unlike the rest of the Festival buildings. One part of the Festival site did remain for a few more years and provided support to the rapidly growing Heathrow Airport to the west. In the early days of Heathrow, transport options to the airport were very limited. The Bath Road ran alongside which provided a route for cars / taxis and there were some limited bus services to the airport, however the extension of Underground and Rail services were still many years in the future. The airlines operating out of Heathrow needed to provide passengers for this new and rapidly growing form of transport with easy access to the airport from the centre of London. 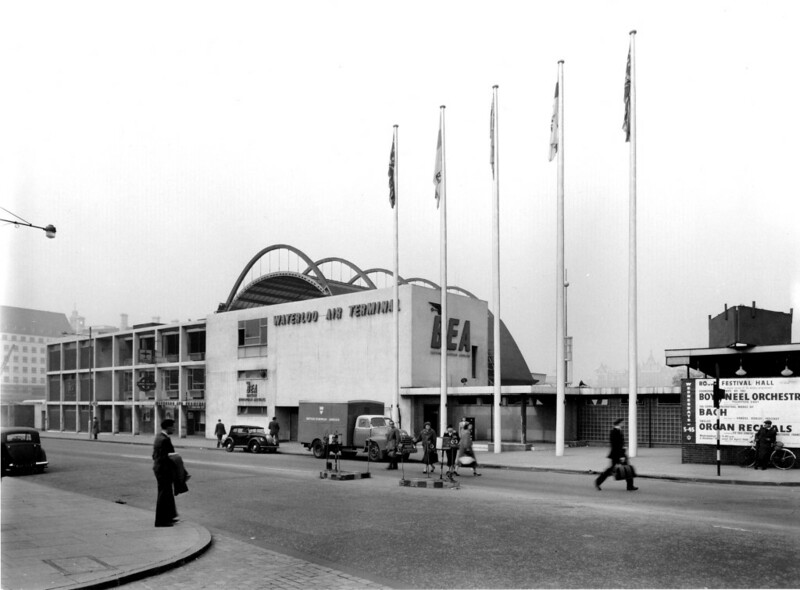 One of the main entrances to the Festival of Britain was on York Road facing the main entrance of Waterloo Station. This entrance also had a dedicated entry / exit to the Underground system at Waterloo with the escalators diving underneath York Road to reach the tunnels to the Northern and Bakerloo lines. The following photo of the Waterloo Air Terminal was taken in York Road from the end of the access road to the main entrance of Waterloo Station. A British European Airways truck is parked outside the building, a poster advertising events at the Royal festival Hall is on the right. County Hall, the home of what was the London County Council can be seen to the left. In the original photo, the London Underground sign can be seen on one of the columns of the building to the left. 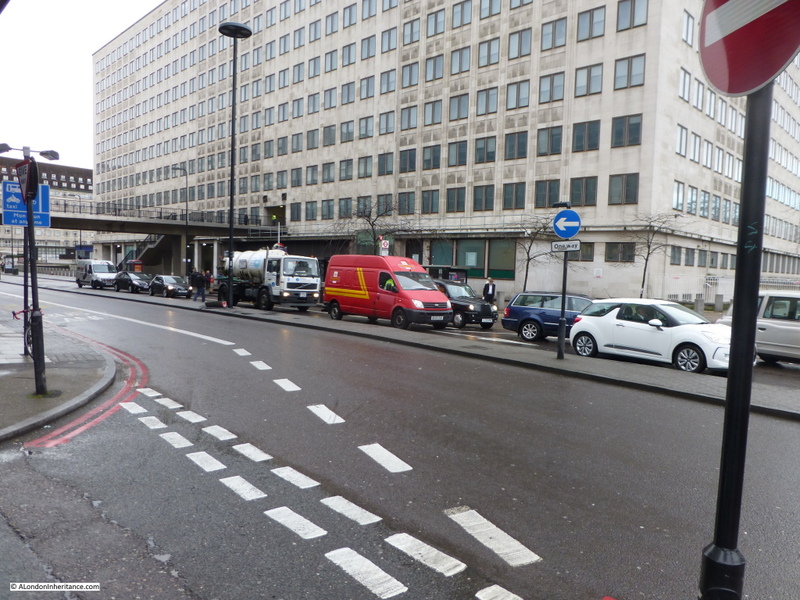 In the 2015 photo the underground station is just under the footbridge as it enters the office block. The station entrance and the escalator tunnels down to the main underground stations have not changed in the intervening years which provides a perfect reference point in the old and new photos. Walk further along York Road towards County Hall and we can look back and get another view of the Air Terminal and the Underground Station entrance can be seen just behind the bus. The Waterloo Air Terminal was in use between 1953 and 1957 and provided check-in facilities, luggage drop-off (which would be collected and taken separately to Heathrow) and a regular coach / bus service provided passenger transport to the airport. For a short period starting on the 25th July 1955 and ending on the 31st May 1956, a trial helicopter service was run between the Waterloo Air Terminal and Heathrow using the space remaining from the Festival of Britain and a Westland-Sikorsky S55 helicopter, however the high cost of the tickets and the limited capacity of the helicopter did not justify running the service and the coach / bus services remained as the primary means of transport. The helicopter service carried 3,822 revenue paying customers during operation. A much larger Air Terminal was constructed by BEA in Cromwell Road in 1957 and the services provided by the Waterloo Air terminal were relocated to Cromwell Road allowing the closure of the site and the redevelopment of the area. 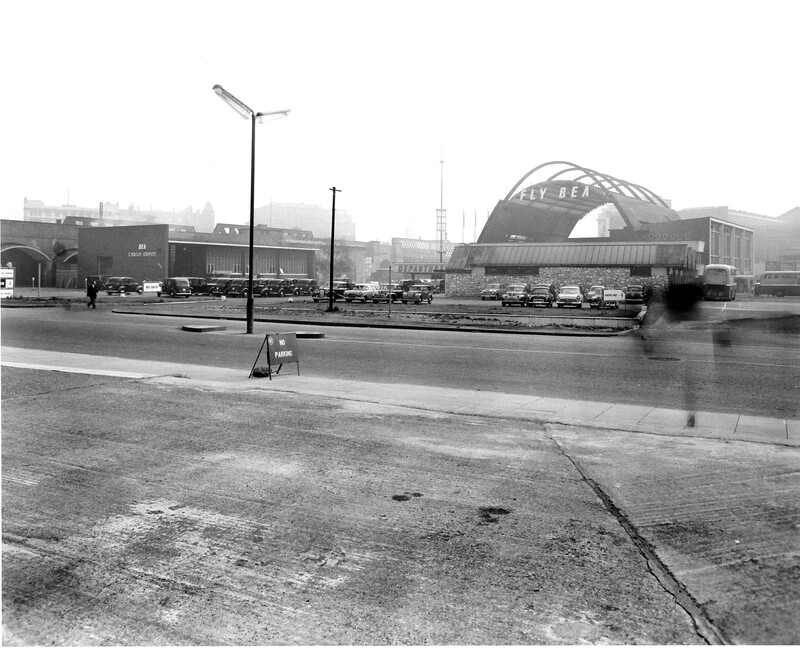 The building that is now located on the site of the Waterloo Air Terminal is Shell Centre, built as the UK Head Offices of the Royal Dutch / Shell group of companies and was constructed on the site shortly after the closure of the air terminal from 1957 to 1962. 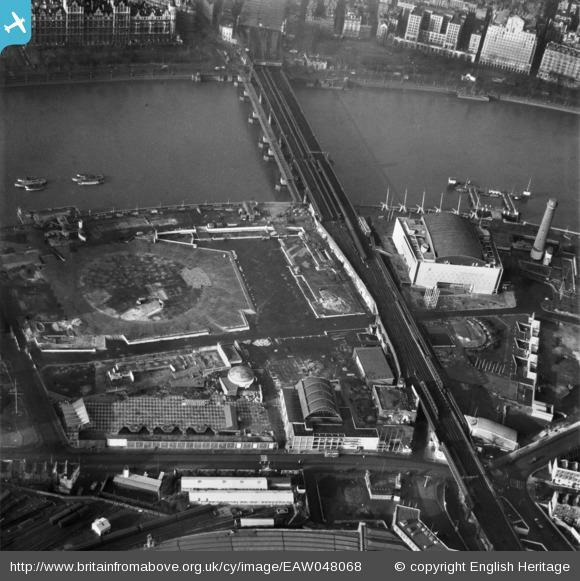 Aerofilms took a superb photo of the site after closure of the Festival of Britain and removal of many of the buildings including the central Dome of Discovery, the outline of which can be seen in the centre left of the photo below. It was the large area occupied by the Dome of Discovery that was used for the helicopter service. The Waterloo Air Terminal can be seen in the lower centre of the photo with York Road running left to right. The curved roof of Waterloo Station can just be seen at the bottom of the photo. The Royal Festival Hall is clearly seen and to the right is the Shot Tower which would soon be demolished. The Waterloo Air Terminal was only open for 4 years, but during those years it played a small, but significant role in supporting the development of Heathrow. A clear sign in the immediate post-war years of how Heathrow would become such a key part of London’s transport infrastructure. This entry was posted in London Buildings, London Transport and tagged Heathrow, South Bank, Waterloo on January 18, 2015 by admin. Very interesting, thank you for posting such helpful photos and explanation of this short period of Waterloo’s history. Fascinating stuff, David! I had no idea about this. I do remember when there was (briefly) a BA check-in at Paddington Station, so that people could have their luggage transported to their flights without having to lug them on the Heathrow Express. It’s interesting how ideas get recycled…..
Close to the river’s edge you can see the old shot tower in the aerial photograph, which dated from the early C19th and was used for making lead ordnance – large pieces were dropped from the full height to make balls and small pieces made lead shot, dropped from a lesser height. This shot tower was not demolished until the 1950s and I believe was used as a display for the Festival. It is a shame it wasn’t kept as an interesting remnant of Lambeth’s heavy industry. You can see something of this industrial past in Lambeth and Nine Elms in the 1829 panorama on our Panorama of the Thames website. Yes, the Shot Tower was used in the Festival of Britain and I agree that it is a shame that it was not retained. Would have made a fantastic historical landmark on the Southbank. I used your helpful site to identify an old slide of the BEA Termiinal. Hi Graeme, thanks for the link to the slide. That is a really good colour photo of the old BEA Terminal. Your modern day photo shows the south. Side of York road. Whereas the old photo shows the building on the north side with county hall on the left. Or did I misread. Never the less. Thank you fir telling me a part of London history I was unaware of. 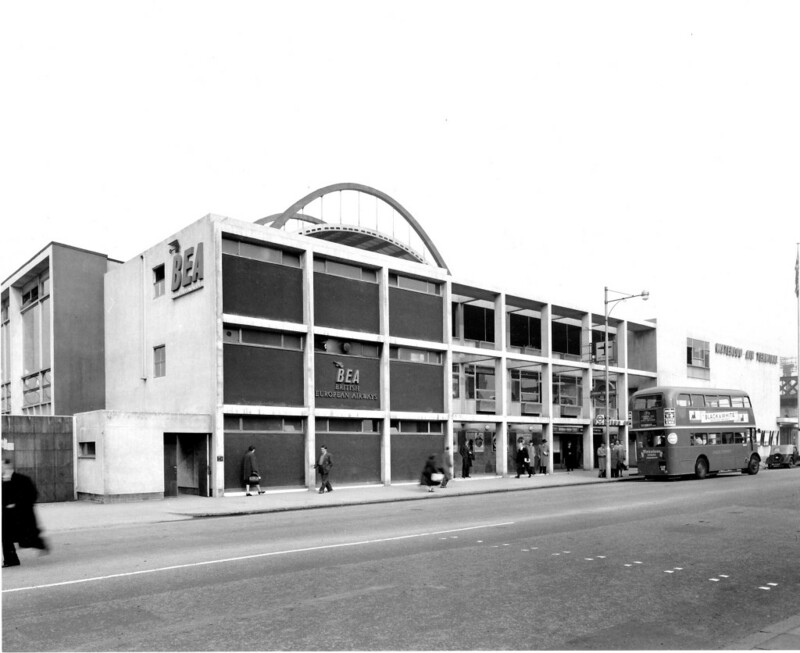 Prior to BEA moving to the Waterloo site its city terminal, known as the ‘Kensington Air Station’ was at street level premises of Stafford Court, Kensington High Street, opened in May 1948. It was then operating Commer Commando half decker coaches which I assume had to park outside in the High Street for passenger and luggage loading. Until 1948 the airline shared BOAC’s facilities at the Victoria terminal. With reference to the Aerofilms shot: it seems that the footbridge attached to Hungerford railway bridge was on the upstream side of the bridge during the period of the FoB. If correct, when was it moved to the downstream side and why? James, the Hungerford railway bridge of 1864 came with integrated footbridges on both sides. The upstream footbridge was removed when the railway approach to Charing Cross Station required expansion. The 1951 Bailey-type upstream footbridge was only intended for use during the Festival and wasn’t integrated with the railway section. We had to put up with the remaining single hopelessly narrow, puddle-enhanced and dispiriting downstream footbridge for many years until the new pair came along in 2002. What a difference they have made to a walk to or from Southbank. Lots of building in that area since 2015. More giant towers. Makes the BEA terminal look even more appealing. Not to mention the lack of traffic.